“Easy listening,” yet quality classical music from around the world…. …captivating repertoire exquisitely performed by Don Bailey. This will be a great addition to anyone’s CD collection. I sat down last night and took your VOYAGE, and a very elegant cruise it was, indeed. Clarity seems to be a hallmark of your playing: tonal, articulative, technical, and conceptual. In short, you sound terrific. Bravo! The CD is just wonderful – a real labor of love. Beautiful music beautifully performed. It is excellent!!!! I really do love to hear some other interpretation of those great Swedish pieces. Good thing you did to change the octave up, you know where I mean… that is what the arranger Jerker Johansson wanted. I will let him listen to your great playing when I see him next time. Your CD is VERY beautiful and I know you will have much success with it…your sound is very Rampalian,..it’s fabulous! Not only is the playing first rate, but the concept of VOYAGE is well thought out, the pieces work well together, the arrangements are beautiful and the overall feeling of this CD is a very pleasing and enjoyable one. I highly recommend it. It is beautiful. I think people should be grabbing this up – it is so refreshing to not just hear the same old warhorses done yet again by yet another flute player. You should be doing lots more recording. Don Bailey has released a CD that showcases a number of lesser-known flute jewels, and the flute world should be grateful to him for it. These pieces are beautiful, and the musicians offer lovely and convincing interpretations. The recording quality is superb, the energy level high, and the flute playing extraordinary. Add this CD to your collection, because it’s one you’ll listen to again and again. I am very impressed with VOYAGE. Excellent recording quality and superb playing. First rate all the way. The repertoire on the CD is fresh and different, the playing top-notch: I don’t see how you can go wrong with this one. Your sound is just wonderful and the pieces were all delightful. The positioning and variety of pieces make for a great program. Great mix job too – I thought the string quartet sounded like a chamber orchestra. 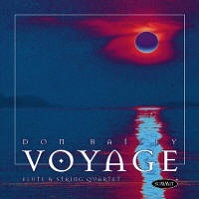 Don Bailey’s VOYAGE is a truly outstanding CD, with first-rate performances of beautiful music known and unknown. I am proud to be represented on this disc. I just put on ‘Four Fancies’ to give me a taste of your playing and I was charmed by it. It is a superb piece played to perfection. I am so glad you like playing Gordon’s music and sincerely hope you will eventually manage to get the concerto on disc. I wish you every success in your musical career. Voyage, Don’s first CD…containing music from around the world (UK, Sweden, Russia, USA, France, Poland, and Argentina), is beautifully packaged and contains illuminating program notes about the music and musicians. I particularly liked the lovely Four Fancies by Gordon Jacob and W. Peterson-Berger’s Frosoblomster, a longtime favorite of mine, which Don performed with sensitivity and elegance. His interpretation of H. Alfven’s Herdsmaiden’s Dance showed clear articulation and the joyful lightness that the piece requires. I was fascinated by Papillion by Kohler. I’ve played and heard this piece for flute and piano, but here Don presents it arranged by Adam Manijak for string accompaniment. This arrangement wasn’t any better than for piano, nor worse – just different, a new alternative. I thought it was a creative, innovative endeavor. I enjoyed list member Katherine Hoover’s On the Betrothal of Princess Isabelle of France, Aged 6 Years, especially, as well as the Tschaikowsky, Foote, and Ginastera works included. The Paderewski Minuet in G was another charming arrangement that ends this sophisticated, thoughtful recording. Don’s playing is expressive and he has a clear, pristine tone. His judicious use of vibrato gives him a great variety of tone color. Most of all, I appeciate how Don takes time in the music, never rushing, phrasing with care and musicality. The disk is very beautiful. I like this format of the Corigliano piece, and I particularly love the haunting piece by Katherine Hoover – it feels like the place where the entire disc gravitates. There are a lot of flute recordings out there, but VOYAGE is one of the few that I’ve enjoyed listening to from start to finish. I enjoyed VOYAGE very much. I will review it for our next Peterson-Berger newsletter. You may be sure I will have nice things to say. I hope you have a lot of success. I have listened to VOYAGE several times as I make my daily trip to the practice rooms in the early hours of the morning. An absolutely beautiful thing happened to me a couple of weeks ago. As I was nearing the music building, I looked out across Lake Michigan. I then looked towards the sky and there were pink and blue clouds stretched about the sun. I was listening to “Sommarsang” (#6 on your CD) and when I lifted my face upwards, an interval rose with me. A quietness settled over me that I had not felt in some time. The remainder of the day I felt a calm presence about me, and the past few weeks have been the most beautiful of the entire year. I don’t know exactly what came over me or if it will even stay, but I wanted to let you know that a very simple melody triggered a very deep reverie.